I was just making a backup with grsync when I accidentally unplugged my external hard drive. Any ideas. Ideally I would like to recover what was on the disk (very much in fact!). 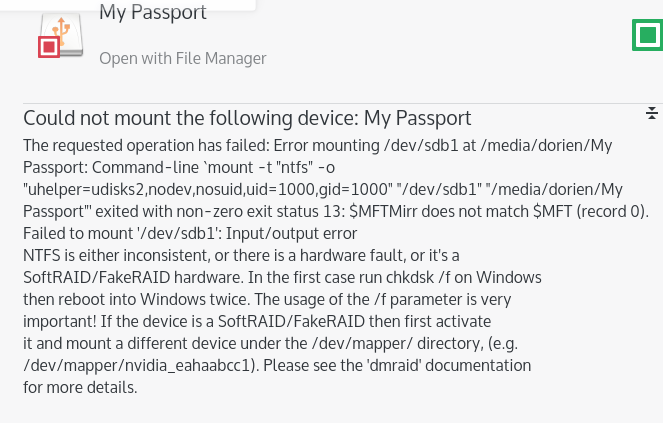 I had a USB stick which got corrupted for some reason, and would not mount. I used G-parted to re-partition the drive. Once it got re-partitioned it would mount. Probably wont help as you'd likely like to save the data on your external-drive. The handy tool "testdisk" will do a very thorough scan of your disk. It also includes photorec, which will assist you in data recovery before you can partition the disk again with gparted. Check this post for a nice list of other tools that fit your recovery needs. Not the answer you're looking for? Browse other questions tagged partitioning mount hard-drive filesystem or ask your own question.